This is the most obvious situation where our customers deal with paper. This is the front-line in the war on paper. Many of our customers still receive paper-based information via snail mail and fax. They use our capture software to scan the paper documents right in the mailroom and to automatically extract as much information out of the scans as possible via optical character recognition (OCR) and data extraction which recognizes important data in the document (i.e. address, date, PO number etc.) to extract the metadata. Same thing happens with faxes that are captured using our fax software where the same OCR technique can be applied. - Publishing - which is a form of communication using the same content asset(s) for a given target audience (more than one person). Publishing can occur online, on a portal, via mobile devices, email, etc. but it can also happen using paper - for example as a book or a marketing brochure. - Customer Communication Management (also known as Output Management) which is a communication that has been personalized for a single individual. An example of such communication can be a utility bill which contains data about your monthly charges but it can also include useful, personalized tips on how to lower your next bill. This type of communication can again occur via a multi-channel delivery, one of which is often paper. Managing records involves often the capability to manage physical records as well. The physical records - usually pieces of paper, but sometimes also objects such as police evidence - need to be kept the same way as electronic records, except that they don’t fit into a digital content repository. With physical records, the cost of storage is a major issue and records disposition usually means freeing up physical space on a shelf in a warehouse where those boxes of physical records are stored. The physical warehouse space is a major cost factor and many customers are approaching us today with projects to convert existing physical records stores into electronic records en masse. Yes, I know that the main idea of business process management (BPM) is to route information quickly from step to step and task to task - which is ideally done in an electronic form. But a few of our customers have to live with the paper-based process for now and yet they find inefficiencies in using BPM to track the status of each process instance. The workers complete their tasks on paper and then they “check off” the task in the BPM system to alert the next person that a task is coming. I know, I know...this is not the kind of BPM I usually recommend to our customers but I’ve seen it happen. Actually, this approach still delivers many of the BPM benefits. The manager can monitor the status of all the workers and processes, the processes can be optimized, the bottlenecks can be identified and the work teams can be re-aligned as needed. Those are some really cool benefits of BPM. Still, the plan is usually to add the capture software to get rid of paper altogether! These are some of the use cases where our customers deal with paper - often as an intermediate step on the way to a paper-free enterprise. The paper-free vision is a great one but we will be probably dealing with paper for a long time. Any step that moves us in the right direction deserves a credit. Here is to a Paper-Free World! That has been the challenge for many enterprise in reducing paper work and paper existence for business operations. 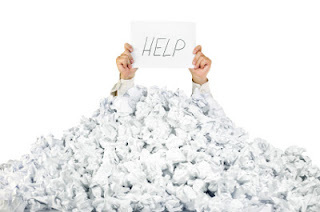 A lot of companies managed to reduce paper via enterprise network management tools that generated electronic spreadsheets like PDF and word formats. Banks have been successful in paper-less banking.